This is new book of short stories about real life the author has experienced. There is evidence that death is just part of the cycle of life and we continue to renew ourselves just as nature does. Read about her real life stories recounting conversations with the dead, enjoying out of body experiences, re-living past lives and visiting with religious figures. At a very early age Linda was told by a young classmate who was dying of a brain tumor that it was created by her thoughts and if she had wanted she could have cured herself with her thoughts. Being only about 10 years old she took in that information and trusted that whatever ailment one was experiencing one could undo it with their thoughts. Linda has enjoyed a healthful life since then and loves to educate others on how to change their body with their thoughts. That sent Linda on a life long quest to understand the mind and its relationship to our body, our environment and our life. For decades she has studied different aspects of mind body healing, creating financial health, happiness and understanding the connection between our thoughts creating our world. Linda is an author, speaker, teacher and counselor. 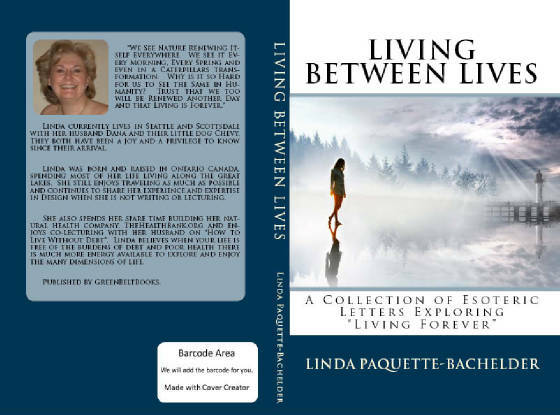 Her latest book titled "Living Between Lives" is based on her personal experience that there is indeed life after death. It is written for those who need reassurance that there is more to living than what appears in this life and when you die it isn't an eternity of black nothingness. Linda is also a numerologist doing psychic readings for her clients @ ThirtyThree6.com and teaches spiritual financial classes with her husband. I know there are people out there that have had odd ecperiences happen to them. Why do you think the ghost Whisperer was so popular? After reading my book you will understand that the smallest thing could be someone you know who has died, trying to communicate with you. The smell of perfume, a touch of your skin, a chill or even a thought. Did you know that the bulk of your thoughts are not your own? We are so interconnected that we pick up other peoples' intentions on a daily basis and think they are our own. Spirits are wanting us to know that they are ok and there for us, if we just ask them to. Haven't you cried out for help when you were in trouble, scared or needing help in some way? The odds are that someone heard you and assisted you somehow. They are not allowed to interfere with our lives, but can be there for us when we ask and allow. Life is so much more interesting and rich when you connect to the multi-dimensional world that is our life. Just relax, breathe deeply and slowly and ask a question. Sit quietly and focus on your breath and wait for a thought to come into your head. The odds are that thought is not yours, but an answer to your question.